Yup, thanks to the 115+ riders that showed up and drank beers at Eich's, I'm sure many animals were saved. Yappy Hour was going on from 4-8. Eich's got a special permit to close the alley and there was a sweet gathering of bikes, dogs and people walking around in thrift store outfits (this month's theme). Thanks FBCers for once again helping our community. So, after helping animals we had to mount our bikes and leave the sweet alley party. The night was superb though and the moon was out in full force. Great views abounded. We rode through South Sand, but just for a bit. Then we ducked down an alley, went down by the marina and finally hit the Sagle path. Our destination was 41 South. Cass and the crew stayed open many hours past their normal closing time. Some riders leached over to Shoga. Damn fine sushi. In all, riders were happy and all the staff did a very nice job of tending to us all. 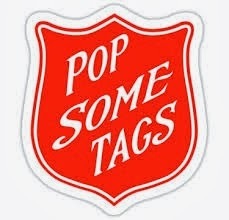 It was glaringly obvious that many members had "popped some tags." There were some great thrift outfits. Some people I did not recognize because their costume was so good. In the end, Best Dressed for the evening went to Lifetime Members for Life Theresa and Collin. Fall meeting time in effect! We gonna pop some tags. Don't know what the hell I'm talking about? Then watch this. Now you got it? Good, now go shopping. There will be prizes for Best Dressed. One last thing, I know some of you are questioning how we will know what actually came from the Thrift Shop or not. You silly little fashionistas, we have well qualified FBC judges that can see right through your cheating costumes. So, don't even think about it. Oh and one more last thing, put lights on your bike. Yes, it is the law. Yes, you can get pulled over. And yes, you can get a ticket.